During the late days of September and early October is when the majority of televisoin viewers tune into Major League Baseball. This is when each game counts, and wildcard teams are fighting for their place in the post-season. The Yankees are right in the thick of things, in an unusual spot in second place in the American League East behind the Boston Red Sox by one and one half game, and are one and half game behind the Indians for the AL Wildcard spot. This means that every game is almost a must-win situation for the Yankees, as if they conclude their regular season one half game behind Boston or Cleveland, their season will be over. The next upcomming game is tonight against the Baltimore Orioles at the Stadium, at 7:05 p.m. Chien-Ming Wang of the Yankees is pitching against Erik Bedard of Baltimore. This is personally exciting for me, as I have seen Wang pitch at the Trenton Thunder, where I previoulsy interned and worked the past two summers (I discuss this in my first blog). I have always enjoyed seeing the minor league players I watched make it to the big leagues! One interesting Yankees' story to update my readers on is the Randy Johnson ejection from this past Friday's game. Johnson is the Yanks' star pitcher, and a future Hall of Famer. He was tossed due to arguing balls and strikes with home plate umpire Fieldin Culbreth in the top of the second inning. This was a disadvantage for New York, as they need their best pitcher at this crucial time to throw strikes and get a win. Johnson later admitted he was wrong in arguing with the umpire. To address my comments from the previous post, I am glad that Jackie enjoyed her first major league baseball game! However, you wrote in your post that you were at Shea Stadium, is that because the Yankees were playing the Mets? The Yankees play at Yankee Stadium in the Bronx, where you said you took the subway to, and their cross-town rivals, the New York Mets, play at Shea Stadium in Queens. Which on were you at? Bernie Williams is a good player; he is getting old however and his future is uncertain at this point. To pinstripes2, I enjoy having a fellow Yankee fan in the area! We are in Philadelphia country, meaning most people do not like New York sports teams, especially the Yankees. I do have faith like you that they will make the playoffs, and I become angry when people say they are out of it. There are a few good days of baseball left to play, and the race is so tight that it is up for anyone to take right now. Thank you to everyone for their comments, and I look forward to the game tonight! I agree with some things you said, and I disagree with others. First and foremost, you are absolutely right; playoff baseball is a great time of year. It's a brand new season and everything counts. I can't wait till the playoffs get under way. However, I hope to not see the Yankees in the playoffs. No offense towards you, but I think it's better for baseball. Seeing the New York Yankees in the ALCS and/or the World Series year after year gets old. Last year, seeing the Red Sox come back from a 3 games to nothing deficit in the ALCS and go on to win the World Series was a historical moment in all of baseball. Also I feel with the players George Steinbrener goes out and buys, the Yankees shouldn't loose a game. Their entire lineup is practically an all-star team, and for them to be having such a dismal year, I don't believe they deserve to make the playoffs. But again, I know you're a huge fan, and I respect your loyal ness towards the Yankees. 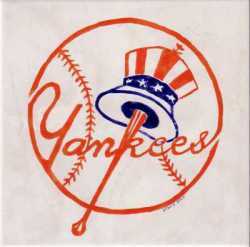 But, if the Yankees are the team to come out of the American League, hopefully the Phillies can come out of the NL. Until then, I will eagerly await playoff baseball. The Yankees are one and a half games back in the AL East. Ofcourse the Red Sox are in first, but I think if the Yankees play hard and get enough runs per game they will be able to come back and take over first place. I can't believe Randy Johnson got ejected in only the second inning. He seems to have quite the temper. I always enjoy when managers or players get into arguments with the umpires, especially when they result in ejections. I know it does not display the best sportsmanship but I think fans like to see an incident like this every now and then. Also, in certain circumstances a player or manager being ejected can ignite a flame under the rest of the team and get them pumped up to go out and win.